My image is this great basket of flowers. I really hope that no one goes through my craft room door the rest of the week because it's turned upside down. I've been working on a big DT project and then I left today to visit my sister for some crafting/girl time. Thanks for stopping by today and be sure to join us this week for this fabulous challenge. Its the end of the month and The Outlawz Greetings Team would like to offer up another 'Anything Goes' challenge. 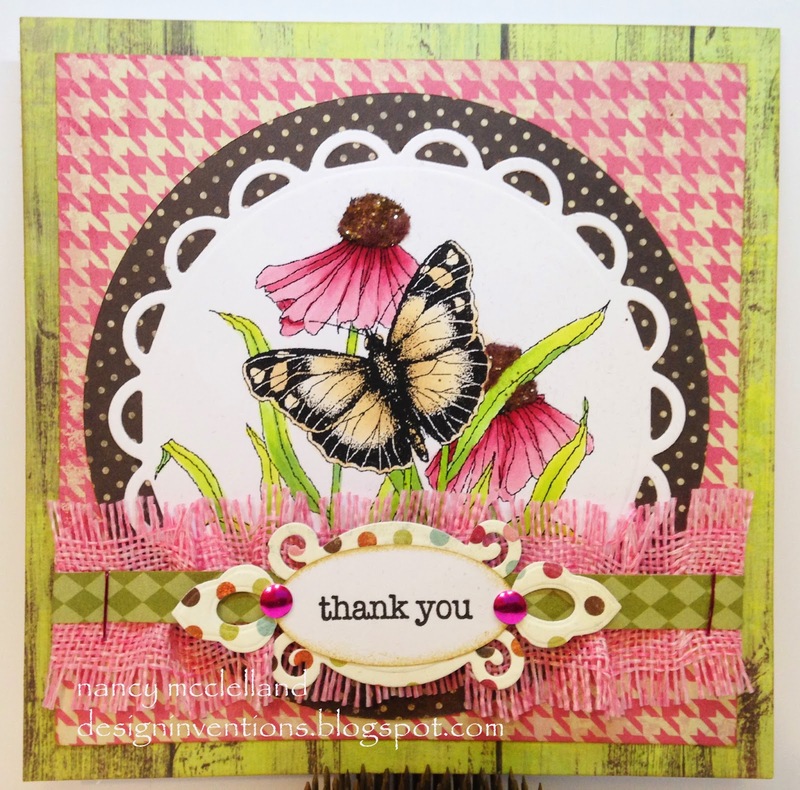 I chose the pink color for my flower and the neutral butterfly. I wanted the image to be the focal point and then not a lot of other accents. I put some brown flock/glitter on the flower centers and then used this fun pink burlap ribbon at the bottom. Great everyday card for my stash. 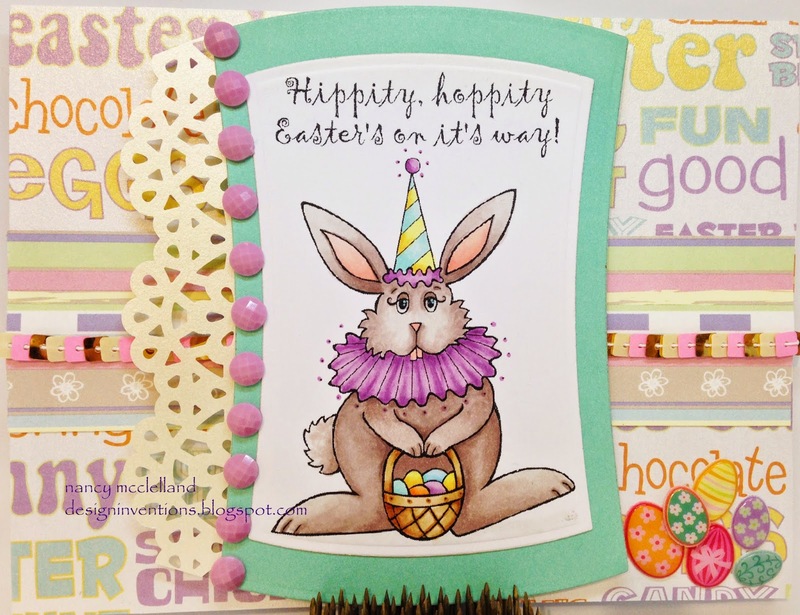 I hope you hop on over to The Outlawz this week and join the fun or at least see the great inspiration we have to offer. 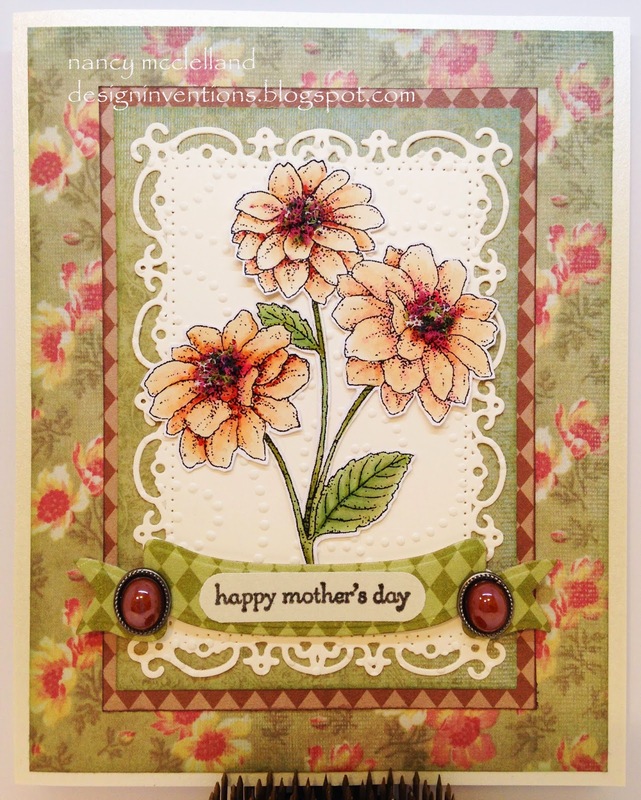 We are featuring 'Mothers Day' cards this week at Hiding In My Craft Room. I chose a simple flower image with unusual colors for me. Yes, you are seeing pinks tones in there. here are the flowers that show the Flower Soft centers. Thanks for stopping by today and have a great weekend. Today over at Creative Corner Challenges we are celebrating Weddings. I know that June is the big Wedding month, so maybe we can help you get a start on those special cards. 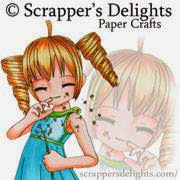 When I went to may supplies I found that I really didn't have a 'Wedding Bell' stamp and I really didn't find a digital image that I wanted, so whats a crafter to do? I decided to use my Silhouette and cut them out. I had a really soft patterned paper in my stash that I wanted to use as the background. 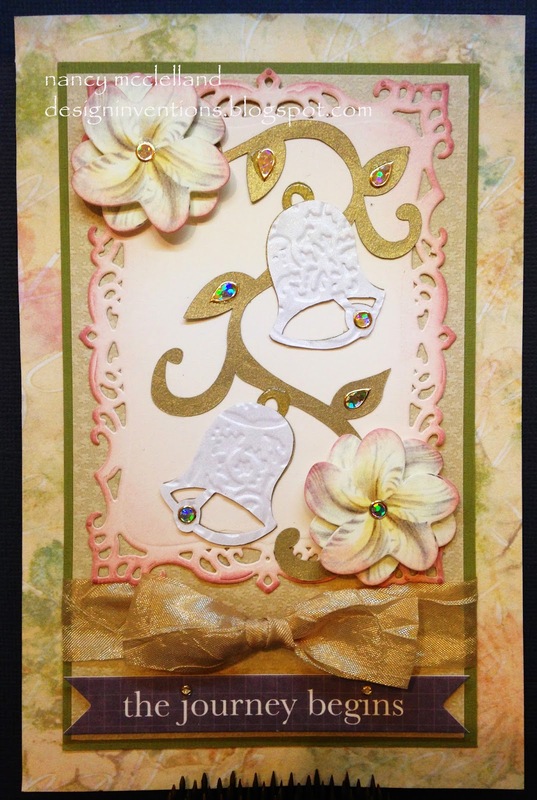 Having the soft green and rose colors, I started pulling out the gold and ivory shimmer paper. 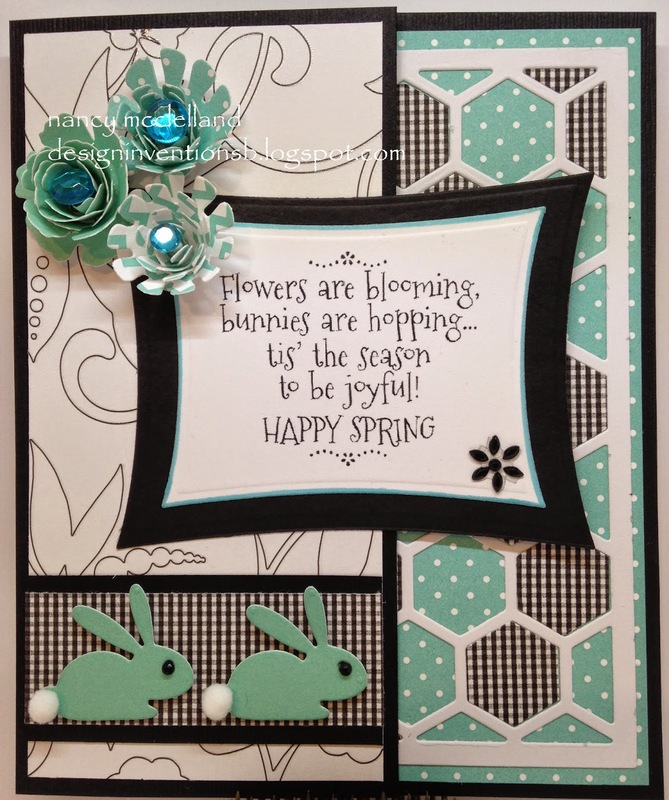 The flowers came out of a Kaisercraft accent pack and I layered several together. Using a fancy Spellbinder Die to mount my design and then some special bling. Simple sentiment and its done. Thanks for stopping in again today. Special "I'm Thinking of You"
The past couple of weeks my daughter has been going through some struggling times, so I wanted to send her a special card. Looking through some of my various supplies that I haven't used in a while I came across these background sheets. They are from Hot Off The Press and are called Color Me, Lace Card Toppers. Mine are in Ebony and the pattern is a glossy embossed black. 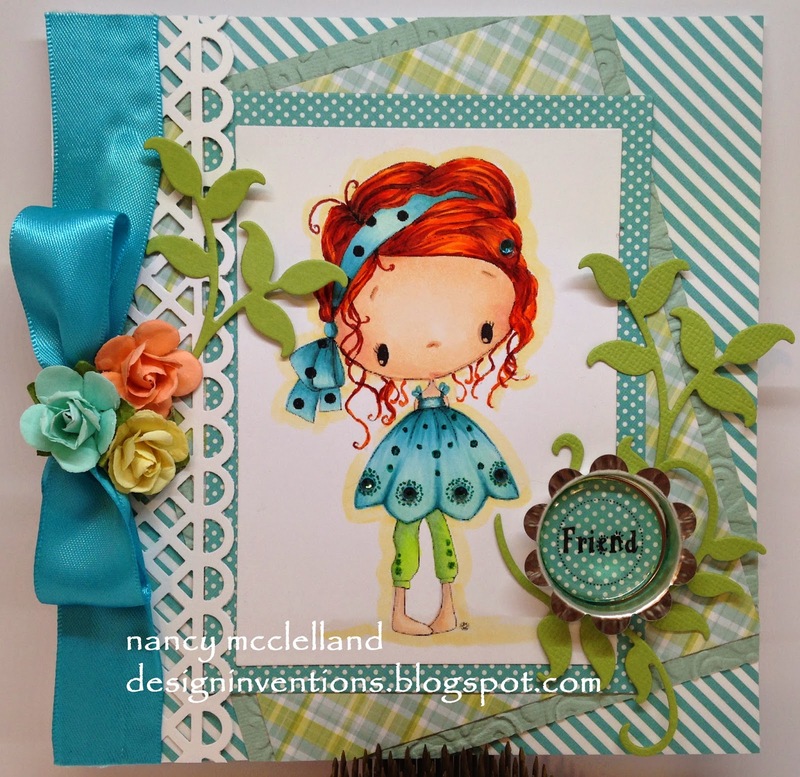 I used Tim Holtz Distress Ink to add some color. 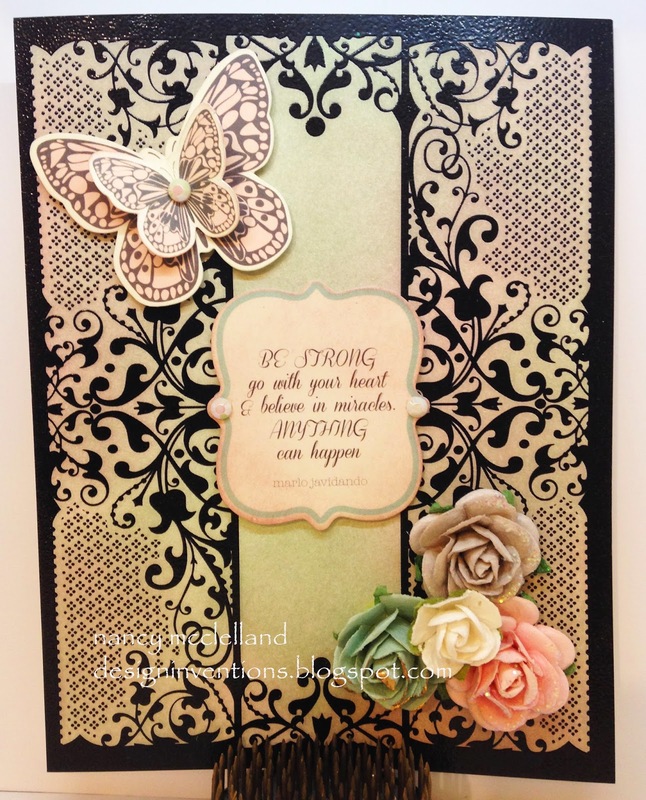 The sentiment and butterflies are from an elements accent pack from Kaisercraft. The flowers are Prima. Now to get this in a box and in the mail. It's the beginning of a new week and that means a new challenge from the Greetings Team at The Outlawz. 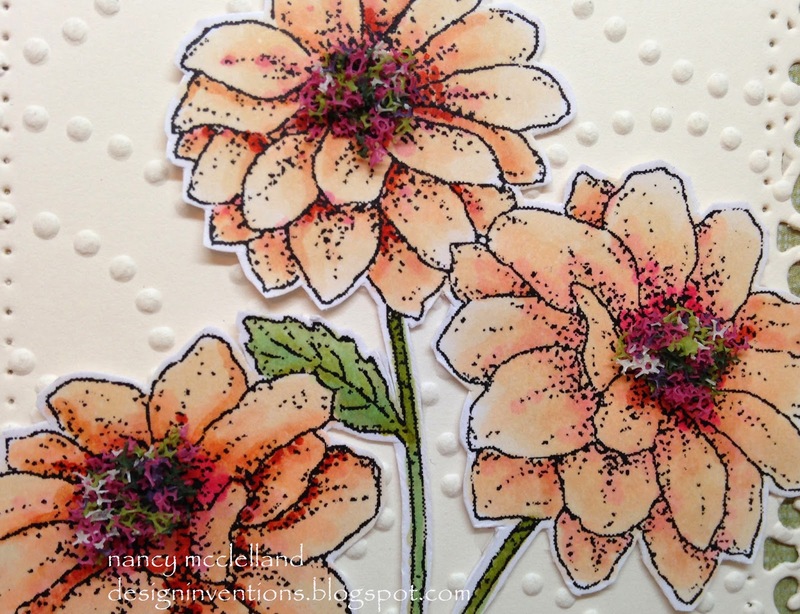 Hopefully todays blog title sparked your interest, and you read on for the details.You can add wet embossing by using ink, powder and heat gun, you can use the dry method which can include embossing folders or use your stylus and make your own embossed lines. Wow, what choices! 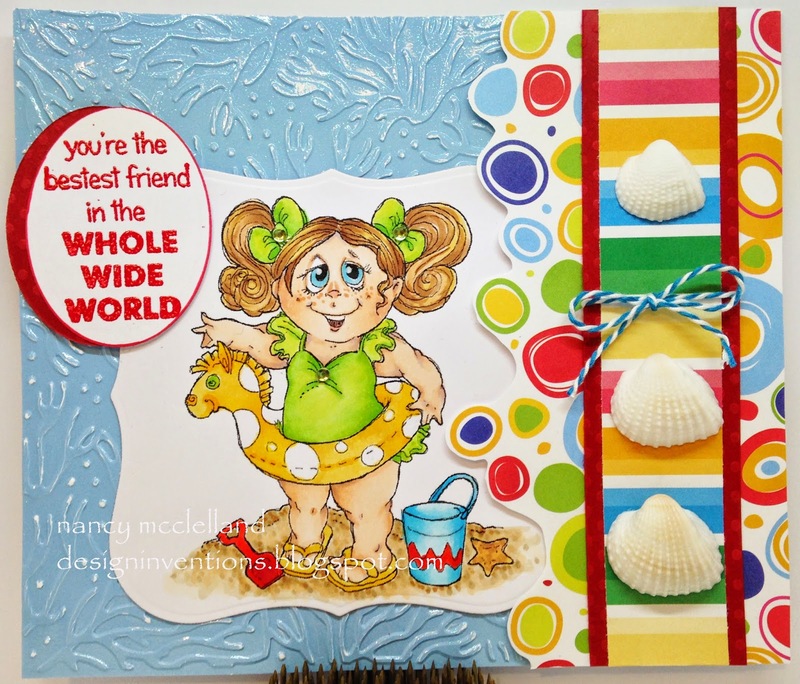 My card for this week is Bitsy at the Beach. I added the three shells on the side to add the beach effect. So Would You Like Some Candy? First off I would like to wish everyone a Very Happy and Blessed Easter. Now over at 613 Avenue Create today we are celebrating Candy Treats. My card this week features an image from Guylou's. I am very pleased how this card turned out. I didn't have a plan when I started, but did select the papers I wanted to work with. I knew since she is a fairy, I wanted to make her a little funky. With some added pearls in her hair and sparkle on her wings, this card is finished. I wish you a Happy Easter and thanks for stopping by today. I hope everyone had a great week and is ready for the holiday weekend. It will be quiet around our house for Easter as my daughter lives in Florida and my son and his family left for Florida on Thursday. 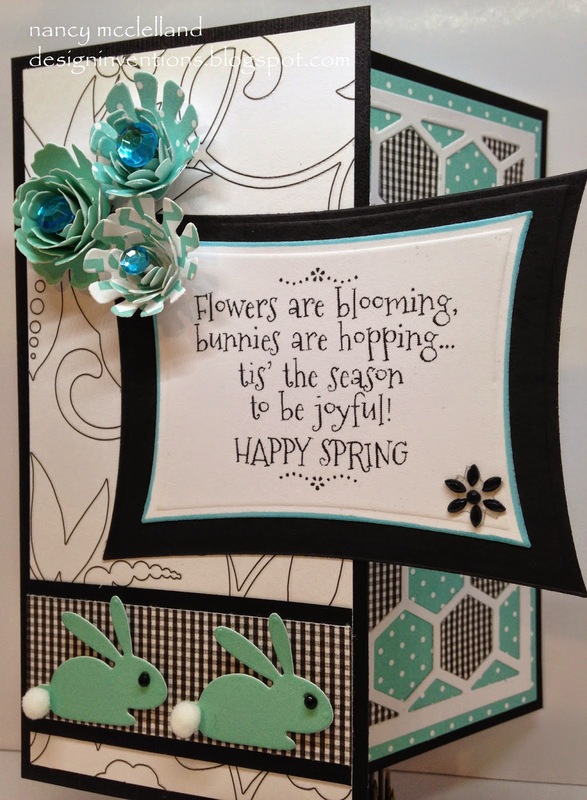 This week the Hiding In My Craft Room design team has some fabulous cards to share, featuring flowers. I seem to be doing alot of Pink and Green lately. Very strange for me, but I guess it has to do with the image. Today is the beginning of another challenge at Through The Craft Room Door. 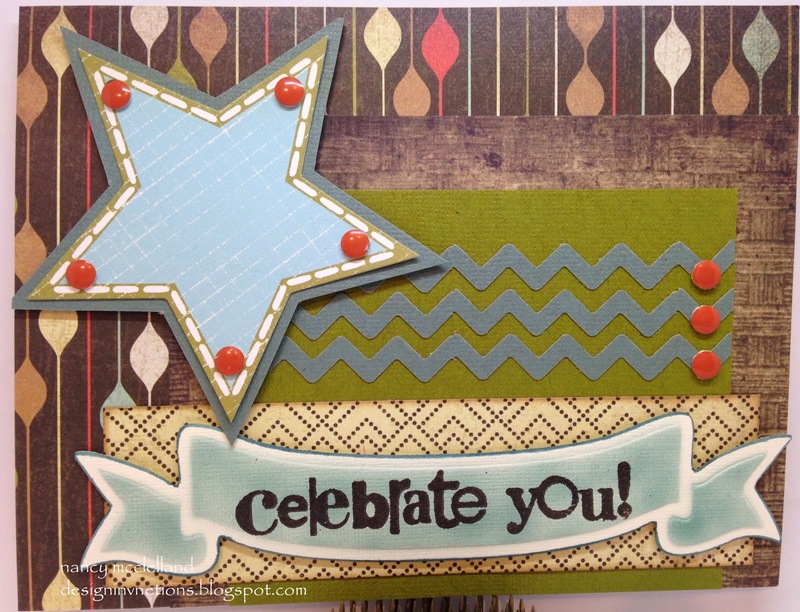 We have some DT on the team and we are all so happy to share our fun creations this week. Our sponsor for this week's challenge is "Oozak" for all your crafting supplies!! 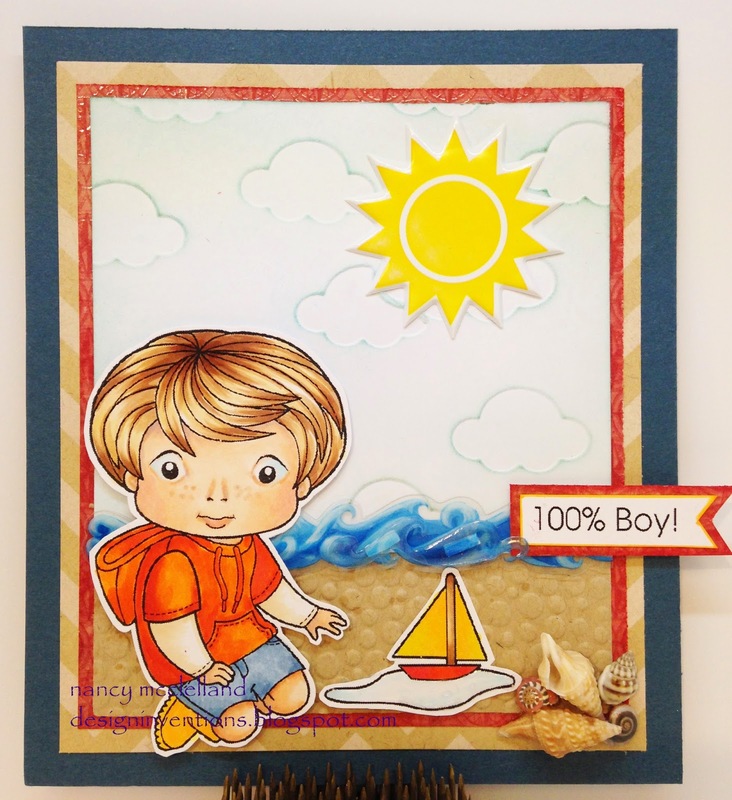 When I picked this image for this weeks challenge I was thinking about my little grandson who is headed to the beach for his first Easter. He is going to Florida to visit his other grandparents who haven't seen him since he was a month old. Jasper is now 11 months old and will take his first plane ride, see the beach and visit many relatives. Hopefully the weather will be much warmer and he can play in the sand. Through The Craft Room Door Spring Issue is now available. The Current issue features over 16 step-by-step tutorials with photo's, including coloring hair with Copic Markers, Awesome articles and featuring two product that you have NEVER seen before. 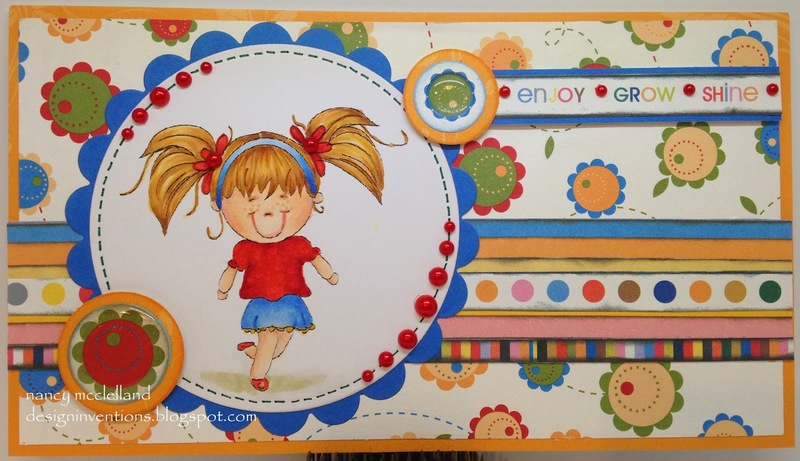 60 + card inspirations, Craft Rooms Around The Globe, Play to win Spellbinders Decorative Labels #22. Feature Digi Artist is "Bugaboo!" Over 110 free digi's for you to enjoy! I want to Thanks You for visiting my blog today. 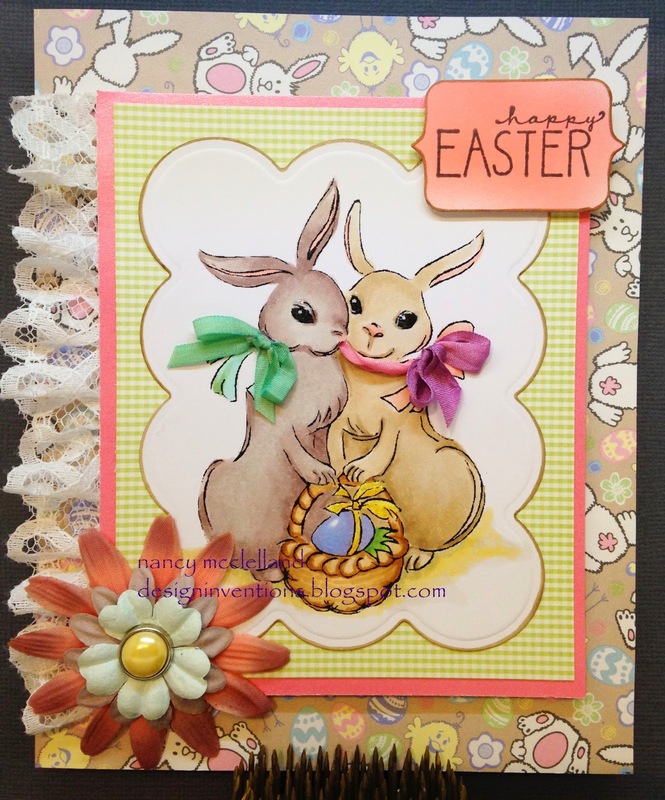 My image has been colored with Copics and then I added some lace ribbon and layered flowers on the side, I also added some texture on the image by using real ribbon around the bunnies neck for their bows. Well this being the week before Easter, I still have some bunnies to share. 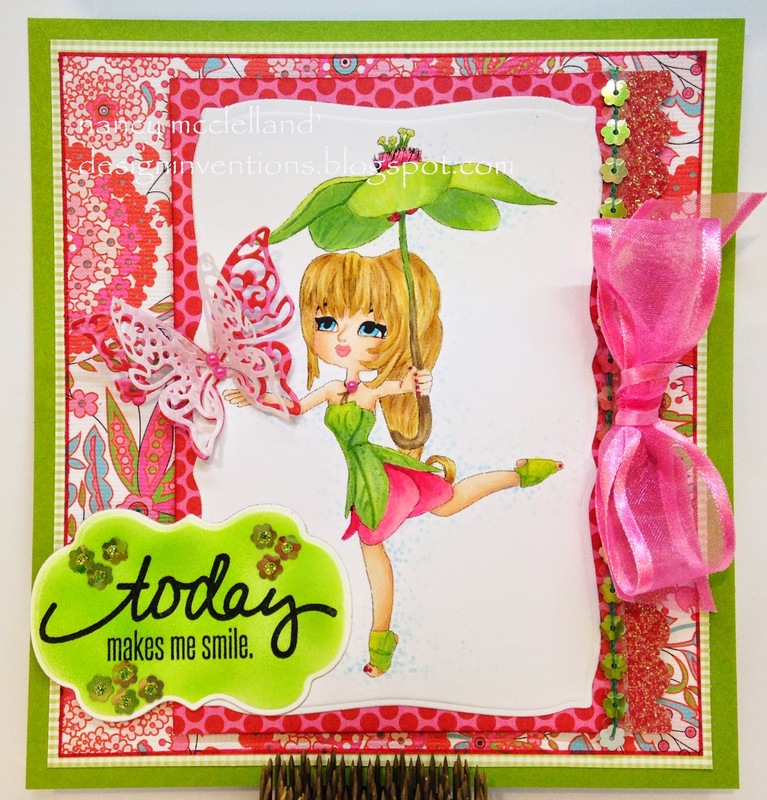 Today is my selection for the 'Let It Hop' blog challenge at Creative Corner Challenges. 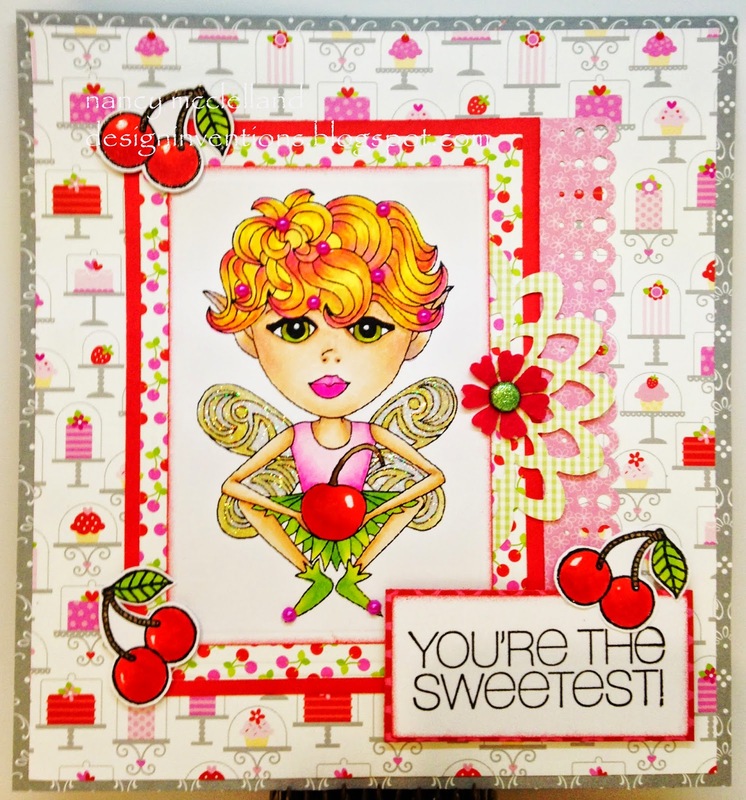 My selection this week is this very cute image, I used Copics to color my image and one of my favorite Spellbinder Die. Team Mel is currently looking for 1 new DT Member. if you have a blog send me the link to that and some information about you and why you would like to be part of the DT team. Thanks for stopping by today and don't forget to stop by our blog this week. I know I've been a little absent this week, but things caught up with me. Switched days for taking care of my little guy, was out of town all day Friday and had three DT projects due. 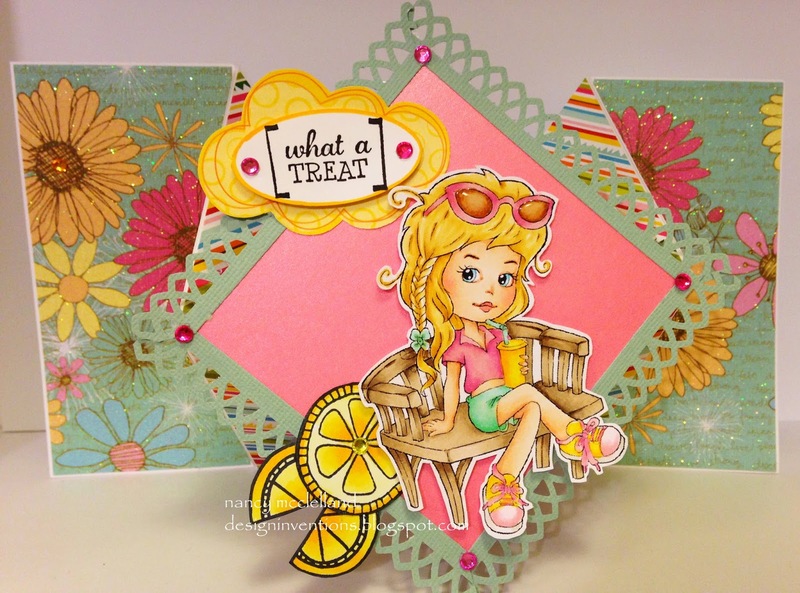 But I'm here today to share another Super Scraps Saturday from Hiding In My Craft Room. How UGLY can it be? This week at The Outlawz we want to celebrate that UGLY paper that you may have stashed away. 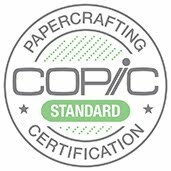 I know many papers that I have purchased that just weren't the best. The colors are off, the pattern is weird and they are just 'what was I thinking' papers. So this week I needed to dig deep to get some of those papers out of hiding. My card using the image "Can't Wait"
I can't even tell you how old this paper is but I'm happy to finally use it. I had several coordinating papers that I cut up to make the accents and use for the sentiment. Some faux stitching around the circle and red pearl gems finish this off. Thanks for stopping by today and please go over to The Outlawz and check out all the other DT cards. I used a Reverse Explosion Card from the Paper cut. It took a little time to plan this card and cut the papers, but I really like the way it turned out. It's Black , White and ????? This week at Hiding In My Craft Room we want to see all those creations using Black and White plus one additional color..
Another exciting thing happening this weekend is we have a new HIMCR Design Team. 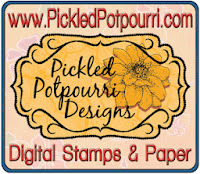 Please be sure to visit all of there blogs and wish them a warm welcome. If you notice a trend this week my card matches my new blog design. I love the color Aqua so that is the given color this week. Thanks again to my new Design Team Buddy, Gracie. There are prizes the next few days over at Gracie's blog, so be sure to go play. I want to share a card this morning that I made for one of our friends whose birthday was April Fools days. I just pulled a few masculine papers, several dies and punches, a few metal brads to complete this card. NEW LOOK and Yes you are at the right place. So do you notice something different? Well, I decided to update my blog design with the help of one of my Design Teammates, Graciellie. This is one talented lady and she designed this new header for me yesterday. I do love the color Orange, but I think Aqua is slowly becoming the new Orange for me. If you know much about me, I'm not frilly or shabby chic. I tend to be more modern and straight lines, but I did tell Gracie that I really like Owls. Not quite sure what it is about them but I think they are cool, so she was able to incorporate them into the new design. I love, love the chevron design on the sides and the addition of black, so classy. Please go visit her blog, she's amazing. Today I have some Exciting News to share. 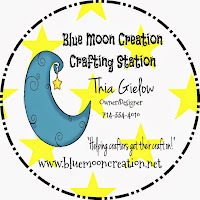 I have been asked to join the Design Team over at Through The Craft Room Door and this week is my first challenge post. 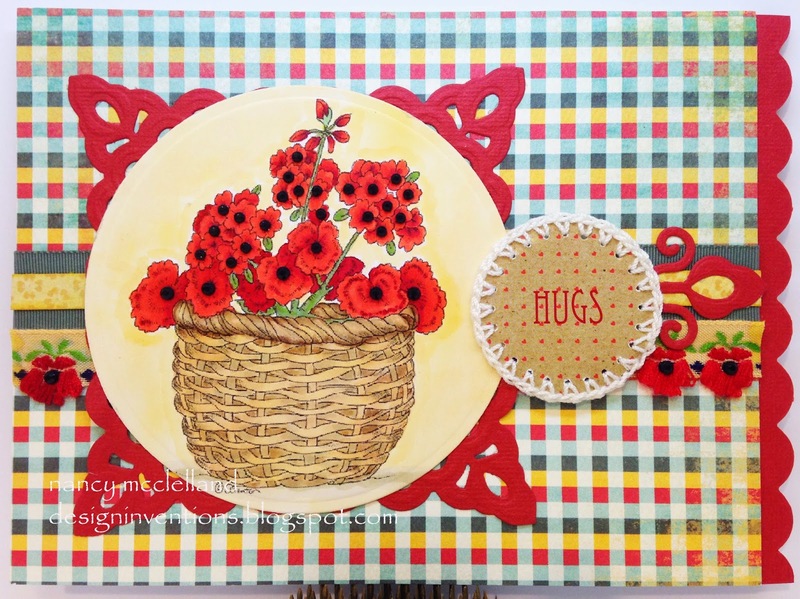 Through The Craft Room Door is a monthly digital magazine and then there is a great challenge blog, that's where I get to play every other week and offer you some inspiration. Through The Craftroom Door is a fun craft magazine filled with articles, tutorials, crafting tool information and a whole lot more! Come and see the many great ideas that have been created! We promise you will not be disappointed. Join our TTCRD NING Group for subscription info and how you can submit submissions to be publish! You could possibly win a $15.00 gift certificate to the store of your choice. Oh yea, there are also over 70 free digital images for you to download. We would love to hear from you so come on over and find out what the magazine is all about! I'm into 'Red Heads' lately and I wanted to use this fun Aqua paper. I had the concept for the card in my head and then started pulling all the pieces together before coloring. I knew I want a statement ribbon on the side, so I basically went to the ribbon closet and made my selection, then the coloring began. Please consider stopping over and going Through The Craft Room Door to see what we're all about.